“Love of Finished Years” by Gregory Erich Phillips is a historical fiction novel that engages readers by providing such vivid detailed descriptions of the characters and events, one feels they are experiencing everything right along with the characters. There are very few books I have read that just leave me breathless like this one. In the story, readers follow Elsa, a young girl, and her family on their journey to a new life as they process through Ellis Island in 1905. Elsa determines early on that she does not like America and suspects even at her young age that the only reason they made the journey was so Anton, her baby brother, could have a better life. Shortly after arriving in America, Anton succumbs to illness, his death changing the course of everyone’s lives forever. Elsa’s father is so distraught over Anton’s death he abandons his family and hopes of a better life in America. Readers will find Elsa as a young woman to be determined and willing to learn and overcome obstacles as they come along. I did find it quite surprising that she would let a rich family's daughter whom she worked for treat her like her servant due to the fact she was lonely. The author’s attention to detail and his ability to capture the emotions of the characters, along with the reality of the circumstances of the times, such as working in sweatshops, unsafe conditions, and sexual misconduct of immigrants, grabbed at every emotion I could possibly experience. The devaluing of females certainly hit home with today’s current events. I found the dialogue, dress and mannerisms genuine and very well suited for each character’s station, and of the era. Also as in today’s world, it seems many of those in rich and powerful situations often took advantage of those they felt were beneath them. Great detail was given to the war aspect of the story, including why some felt the need to enlist early in order to avoid the draft, while at the same time some began to question America’s involvement. One could actually feel the fear and lack of knowledge about the war and the impact it had on those returning. Phillips does an excellent job of capturing the reader’s attention from the first page and holding it solidly until the very last page. 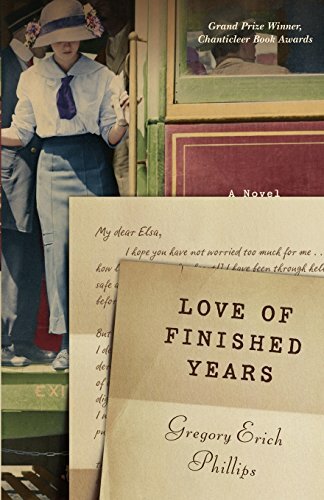 “Love of Finished Years” is a heart-wrenching story full of historical facts and drama that will stay with you long after you finish reading. I highly recommend this book for anyone interested in historical fiction. It would also make a great selection for book clubs, as the author provides thought-provoking discussion questions in the back.